There may be occasions when the offer documentation has been changed and needs to be updated in Broker Brain. 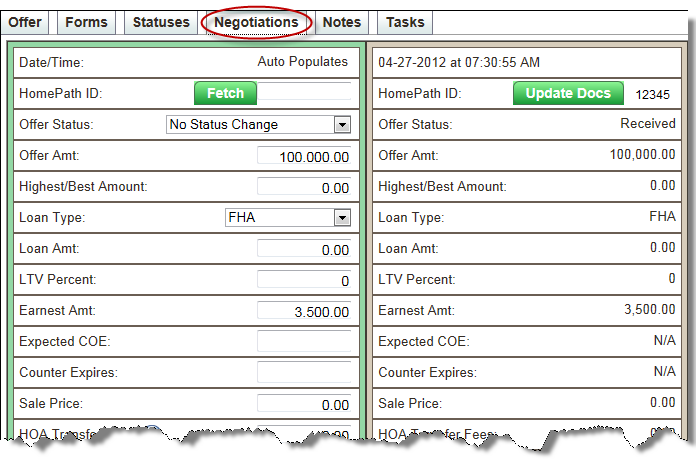 For instance, perhaps Fannie Mae has added new documents into HomePath or made adjustments to existing ones. Or perhaps a Broker Brain user has deleted the note containing the original offer's documentation. In these instances, you would need to run an update. When doing so, Broker Brain will bring in any documents that have been changed. The system is intuitive and will know which documents need to be updated and which do not. If you update the offer and there are no changes, nothing will be uploaded. 1. From the Offers sub tab at left, locate the offer for which you wish to update information. 2. Click the + adjacent to the Offer name to expand the information. 5. Enter your HomePath Login Name and Password, then click the Update Docs button. Any new or modified documents will be uploaded, and the existing note in the Notes tab will be replaced to reflect the changes. The note will reflect the date of the last update, as shown highlighted below. Offer documents are stored in the Attachments section at the bottom of the note on the Notes tab. Attachments can be downloaded by clicking the document's green arrow.